« White Whale hulk enshrouded in fog and questions on the morning after…. 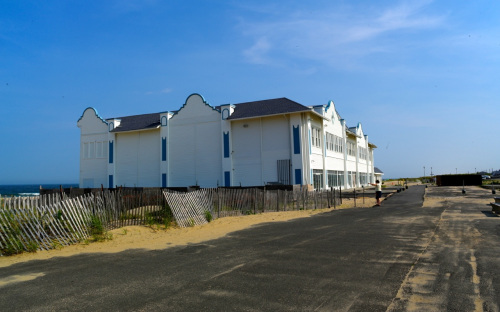 The tale of the great white whale on the OG Boardwalk…..
View of the Pavilion Building looking back from the Casino. It is rumored that another restaurant will be opened there. © Blogfinger photo. By Paul Goldfinger, Editor @Blogfinger and Jack Bredin, Researcher @Blogfinger. The saga of the North End Redevelopment continues and has more loose ends than a Calcutta brothel. One of those unresolved issues relates to the fate of the great white whale at the North End of the OG boardwalk. 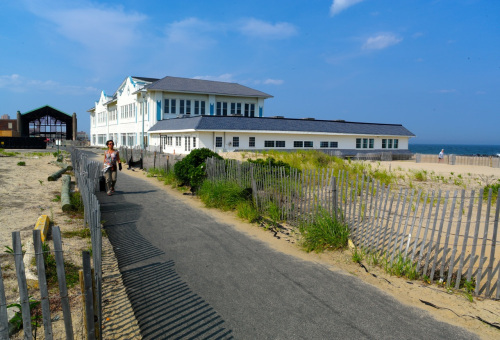 Did you ever wonder about the large white building on the boardwalk’s North End? You know, the one that used to house a restaurant and then, recently, a store that sold beach balls, suntan lotion and dollar stuff. That place is called the Pavilion Building and it is all that remains of the former North End Hotel Complex.